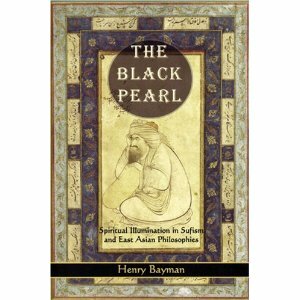 I came across Henry Bayman's writings through his third book, The Black Pearl. That was my introduction to Henry Bayman's writing who is a direct student of Master Ahmet Kayhan Dede, a remarkable Sufi Master and Saint. The Black Pearl was unlike any book I have read before, the subject matter and how it was encapsulated in that book was very unique. Even before finishing reading the book, I felt intuitively that I must have a copy of this book, so I photocopied the book in full and still have it. The subtitle of this book read: "Spiritual Illumination in Sufism and East Asian Philosophies." At that time my serious interest on Sufism as a subject of study has just began and as I was living in Singapore, my exploration of East Asian spirituality and philosophies was on-going. So timing wise it was just too perfect when I discovered his book "The Black Pearl" at the library of National University of Singapore (NUS) circa 2005-2006. Title of the chapters (or sub-sections) of this great book can give an indication of its treasure, I'm quoting some selected ones here: Buddhahood and Prophethood, A Sufi's worship, From Nature to God, God in East Asian Culture, Nirvana in Brahman, None-self but One Self, Emptiness or GOD?, Confucius: The Exoteric Dimension etc. In short, this is a must read book for anyone interested in comparative spirituality, specially those who has appreciation for Buddhism, Zen, Tao and Confucianism. The book is a beautiful bridge of understanding between Sufism / Islam and the major Far Eastern traditions. I believe that Islamic Sufism has much in common with Buddhism, with Taoism, with Zen, and yes, even with Confucianism. At the same time, however, Sufism differs in various respects from each of these paths, to a degree that it becomes worthwhile to write a book about the subject. At the center of the discussion is Absolute Reality: God, the Tao, Buddha-nature, the One (al-Ahad). Branching off from this are: exoteric Confucianism, which deals with morality; esoteric Taoism and Buddhism, and their combined form Zen, which deal with wisdom and mysticism; plus other traditions which are less widespread but nevertheless represent important aspects of Eastern thought. The book description reads: "This sparkling book shows, as never before, how the highest metaphysical reaches of East Asian philosophies are scaled by contemplative Islam. Combining insightful analysis and personal reflection, Henry Bayman explores the mystical dimensions of Sufism, Buddhism, Taoism, Zen and Confucianism. He delves into the striking parallels and seemingly irreconcilable differences in their conceptions of Absolute Reality: God, the Tao, Buddha-nature, the One. Bayman shows how each system of thought can illuminate the inner meaning of the others." So that was Black Pearl, which came out in 2005. His two other title prior to the new one, are: The Station of No Station: Open Secrets of the Sufis (2001) and The Secret of Islam: Love and Law in the Religion of Ethics (2003), both of which if you have not read, you have missed one of the best modern writer on Islam and Sufism, at least in my humble opinion. Henry Bayman is a student of Sufism and an independent scholar who has lived in Turkey for many years, studying with the Masters of Wisdom of Central Anatolia. 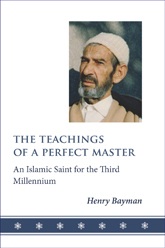 Few weeks back it was a real delight to know that Henry Bayman has a new book out by the titled: "The Teachings of a Perfect Master: An Islamic Saint for the Third Millennium," published by Anqa Publishing. 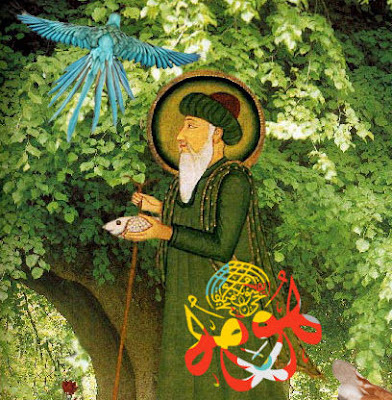 Here, for the very first time, we have at hand the entire curriculum of a Sufi saint. For more than a quarter of a century, Henry Bayman has been in close contact with the Sufi Masters of Central Anatolia. Most of that time was spent in the presence of the peerless Sufi teacher Mr. Ahmet Kayhan. Out of that association has emerged our closest glimpse yet of the famous (and hitherto mysterious) Oral Tradition of Sufism. With permission from the Author, here is an extract from the new Book. I wish the author, Henry Bayman every success, may Allah bless his work and increase the honor of Master Ahmet Kayhan's soul in the Presence of the Supreme Beloved. May this book reach to the heart of those who come to read it, may its transmission be blessed by Allah, the Mercy Bestower, the Generous Giver. Ameen. As everyone knows, each and every one of the prophets has ascended to God. We are not going to explain these Ascents here in detail, but rather will summarize them briefly. There has been no prophet without ritual Prayer, nor without Ascension (miʿraj). Many of them have ascended twice. Adam had his first Ascension when his spirit was created by God. His second Ascent occurred at the mountain of Arafat together with our mother Eve. Idris (Enoch), in accordance with the Quranic verse – ‘We raised him to a high place’ – ascended and did not come back. Noah, at the time of the Flood associated with his name, ascended while on the ship he made by God’s command. Abraham ascended to heaven twice: First, when he was thrown into the fire, and second, at the moment when he was about to sacrifice his beloved son Ishmael. These two are very important points. Jonah, at the time when he was swallowed by the whale, was inspired by God Almighty with the verse: ‘There is no god but You. Glory be to You, I have been of the wrongdoers’ [21:87]. By repeating this verse, he made his Ascension in the belly of the whale. King Solomon, the son of David, told his father he would accept prophethood on two conditions. He said to him: ‘If God Almighty grants the prophethood on both physical and spiritual grounds, I will accept it.’ God was pleased with these words of Solomon, and his request was granted. This became his Ascension, because he wanted it that way. As for Moses, he also performed two Ascensions. In his first ascent, right after his birth his mother placed him in a basket of bulrushes and set him adrift on the Nile. His second ascent occurred on Mount Sinai [Horeb]. The Ascension of the Prophet Muhammad was superior to those of the other prophets. Crossing the Seven Heavens, he performed his Ascension starting from the seventh, conversed with God, and returned with the greatest good news to his community and all mankind. Hidden Knowledge [ʿilm al-ladun: literally, ‘knowledge from Our side’ – esoteric or inner knowledge of things conferred by God], with the permission and order of God Almighty, fills the whole earth and the heavens. I, humble person that I am, cannot explain this here. However, we may be content to give a few ciphers. Do all prophets possess Hidden Knowledge, or don’t they? According to legend, after gathering his entire army, Alexander the Great, with a sign from the Esoteric, started looking for the Elixir of Life in order to achieve immortality. After a considerable amount of exploration, two soldiers set out from the camp one day to continue the search, with the understanding that they would return and report if they happened to find the Elixir. Around noon they arrived at a river. In order to have lunch, they took out some dried fishes and proceeded to eat. When they threw the remaining skeleton of a fish into the river, an amazing thing happened. The skeleton regained life, took on flesh and appeared to them in the form of a living fish. The one known as Khidr peeled a fish, ate its meat and, holding the skeleton from its tail, immersed it in the water. The fish immediately reconstituted, regained life and started squirming in his hand. To his friend, Elias [Elijah], he said: ‘We have found the Elixir.’ They drank from the water, and also watered their horses. Their human attributes disappeared, and sublime, divine attributes came over them.physical space. Someone else was crucified instead, most likely Judas for his betrayal. The Master is saying that in addition, Jesus ascended to God in spirit on this occasion. This water was a flowing water, a river. Whoever drank from this water should have become like Khidr and Elias. However, since their goal was the Elixir, only these two ascended, only they could ascend by this water. The story goes on: The two friends returned to the army of Alexander the Great, but they did not tell Alexander about their discovery. Instead, they requested permission to leave the army and go back. Alexander did not grant their request, since he did not want his army to break ranks. In spite of their leader’s ban, however, Khidr and Elias left the army and started off. Alexander sent his army after them, and ordered their capture. However, during a close pursuit, both of them were suddenly lost from sight. Did the earth swallow them up, or were they raised to the sky? This brings us to Moses and Khidr [see the Quran, 18:60-82]. So Moses obeyed. Water started flowing into the ship. A short while later, they were invaded by pirates. But by this time, the water had already flooded the first deck. Upon seeing this, the pirates fled, among shouts: ‘The ship is sinking,’ and so saved themselves. On the other hand, the people on board had panicked. The captain of the ship was shouting orders: ‘What are you waiting for? Abandon ship!’ Just as they were about to do so, Moses and Khidr plugged the hole with a wooden peg. Water stopped flowing in, the water in the ship was bailed out and they all continued their voyage. When Moses and Khidr got off the ship, they landed in another town. While they were disembarking, youngsters were playing ball just as they do today in a field adjacent to the port. Khidr came face to face with a young man about eighteen years old. Khidr looked at him with a stern face, whereupon the young man attacked him. The friends of the young man tried to separate them from each other. Khidr struck the jugular vein on the young man’s neck, and he died immediately. Moses and Khidr escaped through the crowd in the ensuing commotion. During evening hours they called on a town. No matter which door they knocked on, nobody would open. By then it was midnight. Moses, being human, was hungry and cold. Khidr, since he had drunk of the Elixir with the permission of God, was affected neither by hunger nor by cold. Khidr sighed, and answered him as follows: ‘Moses, you have been too impatient. You could not stand three events. Now, I am going to explain them to you. ‘We drilled a hole in the hull of the ship. You saw with your own eyes what happened next: pirates invaded the ship. They were going to rob the ship and kill us all. The ship owner’s money was honestly earned. I felt pity and saved them. ‘The young man I killed was the son of a prominent man. He was rebellious towards his parents. He also belittled the people of that town. If one day he were to rule there, he would have oppressed the people. We killed one man, and saved a hundred thousand from harm. ‘Consider now this wall. The man who built this house was a righteous man. He built this house with money earned honestly. He put the remaining money in a jug, and buried it near the wall we repaired. (Khidr pointed with his hand:) Right here, beneath this foundation. Moses gave him his hand. Khidr said ‘close your eyes’ and ‘open them,’ in immediate succession. Moses looked around; he was in front of his house. This, with the permission, grant and favor of God, is referred to as ‘the folding of space’ (tayy al-makan). [+] You may read more from the extract from here (PDF) version. [+] Table of Content of the Book here. [+] To order the Book: via Amazon, via Publisher's site.